The philosophies of HENRY DAVID THOREAU (1817-1862)-hero to environmentalists and ecologists, profound thinker on humanity's happiness-have greatly influenced the American character, and his writings on human nature, materialism, and the natural world continue to be of profound import today. In this essay, first published in the Atlantic Monthly in 1862 and vital to any appreciation of the great man's work, Thoreau explores: the joys and necessities of long afternoon walks; how spending time in untrammeled fields and woods soothes the spirit; how Nature guides us on our walks; the lure of the wild for writers and artists; why "all good things are wild and free"; and more. 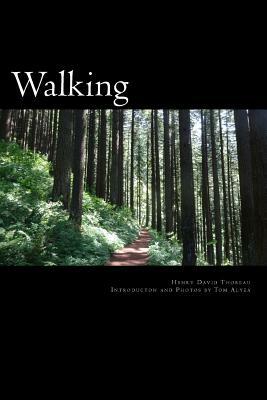 This edition of Walking has a new introduction by avid walker, essayists, and guidebook author Tom Alyea. There are also original photos and quotes to keep you inspired long after you've read the essay.